Laparoscopic splenectomy has been safely performed for small spleens, but technical limitations have prevented massive splenectomy. We describe a technique of early hilar devascularization to enable massive splenectomy in five patients. Massive splenectomy was performed with minimal blood loss and no morbidity. Early laparoscopic control of the splenic artery and vein will enable the safe removal of the massive spleen, without major laparotomy. 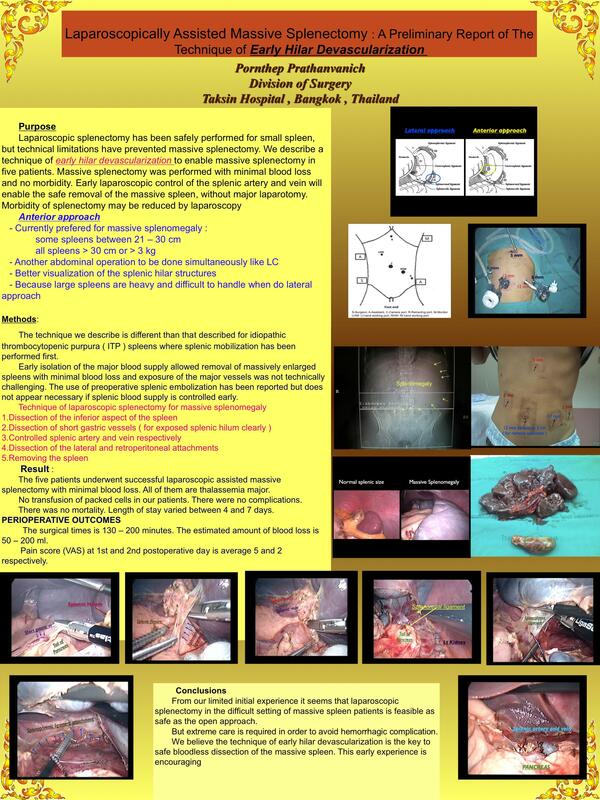 Morbidity of splenectomy may be reduced by laparoscopy. The technique we describe is different than that described for idiopathic thrombocytopenic purpura ( ITP ) spleens where splenic mobilization has been performed first. Early isolation of the major blood supply allowed removal of massively enlarged spleens with minimal blood loss and exposure of the major vessels was not technically challenging. The use of preoperative splenic embolization has been reported but does not appear necessary if splenic blood supply is controlled early. The patient is supine position. Two 10-mm ports and three 5-mm ports are used to allow repositioning of the camera for visualization of the hilum and also the lower pole. 1. Dissection of the inferior aspect of the spleen and the splenic flexure of the colon is then mobilized to give access to the lower pole of the spleen. Result : The five patients underwent successful laparoscopic assisted massive splenectomy with minimal blood loss. All of them are thalassemia major. No transfusion of packed cells in our patients. There were no complications. There was no mortality. Length of stay varied between 4 and 7 days. The surgical times is 130 – 200 minutes. The estimated amount of blood loss is 50 – 200 ml. Pain score (VAS) at 1st and 2nd postoperative day is average 5 and 2 respectively. From our limited initial experience it seems that laparoscopic splenectomy in the difficult setting of massive spleen patients is feasible as safe as the open approach. But extreme care is required in order to avoid hemorrhagic complication. We believe the technique of early hilar devascularization is the key to safe bloodless dissection of the massive spleen. This early experience is encouraging.